Most scientists, policy makers and business leaders agree that reducing GHGs is the single most effective measure to suppress the threat of climate change. But the challenge to protect the environment is far from over. The next step is determining the most viable methods to reduce GHG emissions. And like most things, cost is a significant factor. To help find the best solutions, world-renowned consulting firm McKinsey & Company produced “A Cost Curve for Greenhouse Gas Reduction”, a global study of the various methods for reducing GHG emissions. The 2007 report (updated in 2010) analyzes the significance and cost of numerous available measures, including upgrading lighting systems, transitioning to energy-efficient transportation, utilizing wind and solar energy, and many more. At the heart of the study is a graph (below) that compares and contrasts the estimated costs and effectiveness of the different methods. Each green bar represents a GHG reduction option. 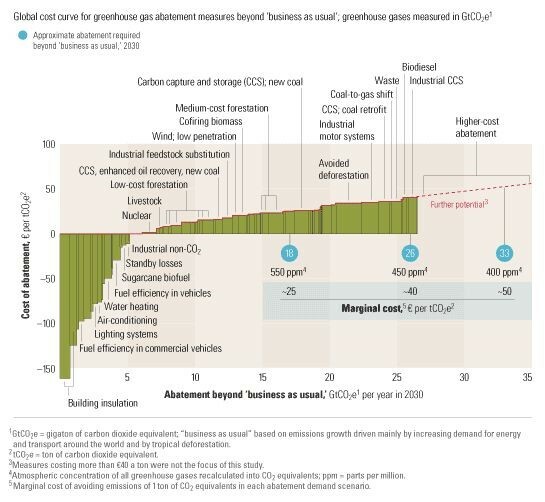 The width of the bar estimates the potential amount of GHG reductions, while the height of each bar represents the cost of implementing and maintaining each method. The bars on the left of the graph that extend below the X axis show the most cost-effective ways to reduce GHGs, while the bars to the right detail the most expensive solutions. As you can see in the graph, the McKinsey report concludes that one of the most cost-effective ways to limit GHG emissions is by addressing the insulation in buildings. There are two main reasons for this. First, upgrading a building’s envelope is a relatively inexpensive installation process and requires very little upkeep (by contrast, some GHG reduction options like utilizing nuclear energy are effective but very expensive to implement and maintain). Whether you’re adding insulation to the ceiling and wall cavities or upgrading a building’s window system with a high performance interior window retrofit, sealing a building’s envelope is simply one of the most cost-friendly energy performance solutions available. In other words, improving the insulation in existing buildings will reduce both overall U.S. energy consumption and GHG emissions. The McKinsey report points out that improving a building’s lighting system is another cost-effective option for reducing GHG emissions. Like building insulation, upgrading the light bulbs in a building is a relatively small investment that requires little labor and minimal downtime. And since energy efficient light bulbs last upwards of ten years, the cost to maintain a new lighting system is virtually nonexistent. In concert with worldwide efforts to conserve energy and reduce GHG emissions, Thermolite is currently working with the Environmental Protection Agency, the General Services Administration and the Department of Veterans Affairs to improve the insulation of several federal buildings via patented retrofit window technology. Unlike traditional replacement windows, Thermolite’s retrofit system is installed on the interior of a building’s current windows, eliminating the costly labor required to remove and replace glass. Thermolite’s retrofit window system creates a new gap that traps air between the glass panes to mitigate heat loss. 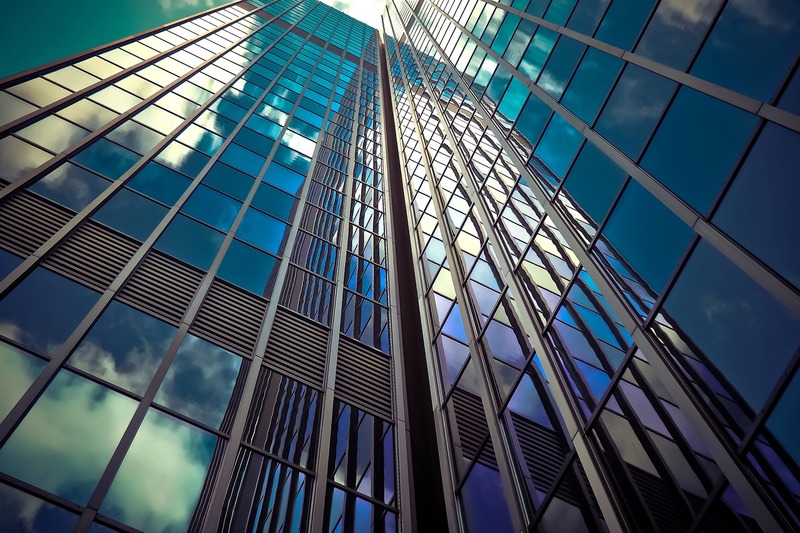 These windows utilize argon-filled low emissivity glass (Low E), which further seals the building envelope by minimizing the amount of infrared energy that can pass through the glass without compromising the amount of transmitted visible light. To evaluate the energy savings attributed to Thermolite’s retrofit window system, the facility staff at the Jacob K. Javits Federal Office Building contracted with an independent engineering firm to conduct a thermal analysis using advanced computer simulation software. The report concluded that Thermolite’s window system increased the R-value of existing windows from <1 to 3 – more than tripling its thermal performance. The building’s ownership estimates that the new window system will result in more than $1.5 million in annual energy savings. The Thermolite window system will also greatly reduce the amount of GHG emissions at the Javits building. Read more about the specifics of the Javits building retrofit here. Founded in 1926, McKinsey & Company is a global management consulting firm comprised of more than 12,000 consultants and nearly 2,000 research and information professionals, including medical doctors, engineers, business managers, civil servants, entrepreneurs and research scientists. Widely considered the most prestigious consulting firm in the world, McKinsey & Company serves businesses, governments, non-governmental organizations and not-for-profits, publishes the McKinsey Quarterly, and funds the McKinsey Global Institute research organization. For more information, visit www.mckinsey.com.